This IBM Redpaper™ publication describes practical scenarios that show the API Connect capabilities for managing the full API life cycle, creating, running, securing, and managing the APIs. This Redpaper publication is targeted to users of an API Connect based API strategy, developers, IT architects, and technical evangelists. 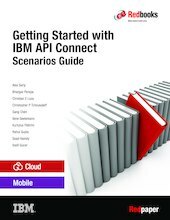 If you are not familiar with APIs or API Connect, we suggest that you read the Redpaper publication Getting Started with IBM API Connect: Concepts, Architecture and Strategy Guide, REDP-5349, before reading this publication.